The people of Hawaii face a new threat, potentially deadly, related to the eruption of Kilauea volcano. This Sunday, authorities warned of the dangers of the arrival of lava rivers to the Pacific Ocean, which can produce a large toxic cloud of acid gases. The entrance of hot lava in the ocean could contaminate the air with a substance known as laze, by the combination of the words lava and haze. The eruption claimed its first serious wound Saturday, when the lava reached the leg of a man who was on his balcony on the third floor, local media reported. The victim was on the balcony of his home when the lava flew through the air to hit the lower leg, said a spokeswoman for the county of Hawaii, Janet Snyder, to the local television station HawaiNewsNow. "It hit him in the shin and smashed everything down there on his leg," Snyder said. The man, who has not been identified, was taken to the hospital with serious injuries. 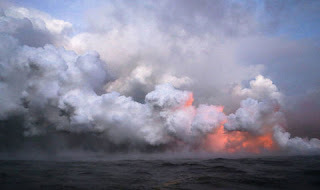 The lava, when in contact with the water of the sea, sends air particles of fine crystal and hydrochloric acid, which are displaced by the wind and "can change direction without warning" and, as indicated on its website, the Civil Defense of the County of Hawaii, "can cause irritation of the lungs, eyes and skin." The department has alerted motorists, navigators and bathers to beware of this phenomenon, caused after two lava flows have reached the sea after crossing Highway 137, on the south coast of the Big Island of Hawaii, between the last hour of Saturday and the first hour of Sunday. In the last few hours, the United States Geological Survey has reported that volcanic gas emissions "have tripled." Due to moderate winds, in the areas located in favor of the wind, air pollution will increase due to the combination of emissions with humidity, dust and sunlight, so the authorities have asked the population to "take measures to limit exposure". A giant wash, which reached six meters in height, blocked part of Highway 137 south of the island on Sunday, a local television station reported. Kilauea is one of the most active volcanoes in the world and the largest of the five in the Hawaiian Islands. The eruption forced the evacuation of some 2,000 people. When coming into contact with the sea water, the lava is at about 1,000 degrees Celsius. In the atmospheric conditions of this Sunday, with strong winds and abundant lava flows reaching the ocean, the pollution could extend up to 24 kilometers, mainly following the coastline and the sea. The air quality in Kona, 64 kilometers from the volcano, was at the "orange" level, which means that elderly people with lung problems could be affected. The authorities do not fear that there are victims because the most vulnerable residential areas have been evacuated and the region where the volcano is located, in the southeast of the island, is not very populated. In a similar situation in 2000, the hydrochloric gas haze killed two people. The United States Geological Survey has compared the acid rain that it causes with the corrosive capacity of the acids in the batteries. Kilauea, one of the most active volcanoes in the world, began throwing lava and vapors of sulfuric acid through several open fissures on its eastern flank on May 3. Then it began the last phase of an eruption cycle that has continued almost nonstop for 35 years. The opening of at least 22 points through which the lava flows has been accompanied by periodic earthquakes and eruptions of ash, volcanic rock and toxic gases in the crater of the volcano. The lava has destroyed dozens of homes and other buildings. With highway 137 cut off, authorities tried Sunday to open nearby highway 11, which was blocked four years ago by another eruption, to use it as an alternative route. Scientists believe that the volcanic activity that has been recorded in recent weeks may be the announcement of a large eruption, similar to others recorded in the Kilauea in the twentieth century. According to technical experts from the public agency that supervises the volcanic activity, it is possible that a more violent eruption is underway, with more viscous lava and at a higher temperature, which could erupt up to a height of 180 meters, as happened in 1955.